Just picture yourself walking into an old ghost town that has been abandoned for 120+ years. You see the old saloon and work your way inside past the dilapidated swinging doors. On the bar you see a bowl covered with dust and cobwebs. You dust the bowl off and what do you see? 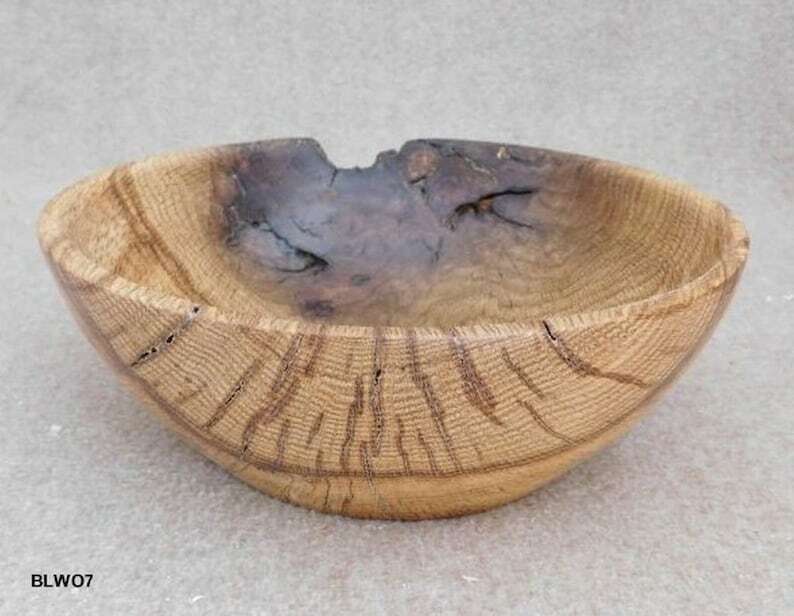 It’s a beautiful old white oak bowl that was probably used for peanuts or potato chips for the patrons. Age has taken it’s toll and at the same time added to it’s good looks. Knot holes, cracks and great coloration make you want to take this bowl home with you. The diameter is 9 ¼” with a height of 3 ¼” and a depth of 2 ½”. Estimated volume is ½ gallon. The wood was sealed with food grade walnut oil and finished with a walnut oil/shellac mixture. This bowl is meant to be used for fruit, nuts and other tasty goodies that are not liquid. Though it has a nice natural finish I do not expect this bowl to hold liquids. 10Mar18 BLWO7 Free shipping within Continental US only.